Research and Monument Photograph Service is available for members of the FOGN at a cost of £15 per enquiry (one family name search) and for non-members at a cost of £25 per enquiry (one family name search). Please provide a name/s of the family and date/s of death in the first instance. 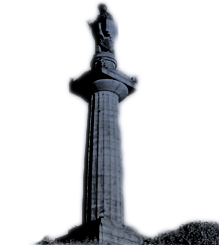 Research and Monument Photograph Service is a manual search by volunteers of our database (see below) on behalf of an enquirer and on receipt of the above fee we would provide a photograph of the monument. We would also provide the transcription of the inscription where legible. In some cases a search of the database may identify other possible relatives. However we can also offer a more comprehensive Research, Monument Photographs, Map and Visit Service which includes further photographs of the headstone or monument in its location, a map showing its location and an accompanied visit with one of our guides to the monument should the family wish or be able to visit the Glasgow Necropolis at a cost of £50 per enquiry (one family name search). This is still a working cemetery and over 50000 persons have been buried in the Glasgow Necropolis. The Friends of Glasgow Necropolis is developing a database of names of persons buried or commemorated in the cemetery. So far over 25000 people have been recorded in our database. We would also like to invite the enquirers if possible to add photographs and information to include on our Profile section. سایت ریور پوکر پوکر آنلاین . download game for iphone 8 . Super and Nano paint protection for cars from Nasiol.